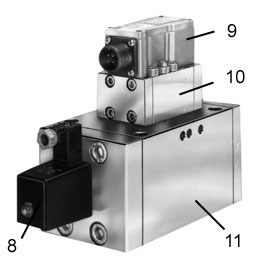 A servo valve that is simple, rugged in design and dependable in performance to give superior system control and long trouble free operation. Torque motor is isolated from and not contaminated by the fluid. Can be used with high water content fluids. There is no mechanical connection between the magnet system and the power spool. Easy accessibility for fine tuning valve. Protects orifices and nozzles from contamination and resulting performance degeneration. 8. 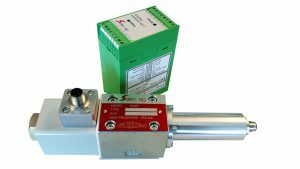 Selec servo valves can be driven by Selec ’s standard amplifier for superior performance, but they can also be driven by amplifiers manufactured by others. 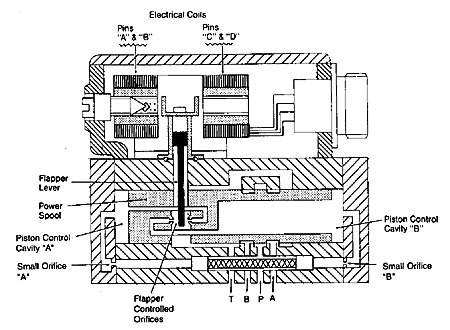 A linear variable differential transformer (L.V.D.T.) is used to monitor the position of the main spool on a three-stage valve. 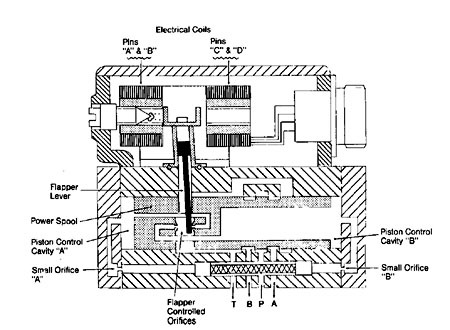 Differential Transformer (L.V.D.T.) for feedback. 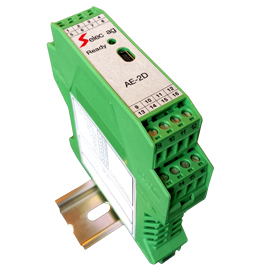 Selec is a hydraulic equipment manufacturer totally dedicated to microelectronic control systems. Electronics is integrated in Selec’s hydraulic engineering as a integral part of the engineering department. CAD/CAM insures optimal system design incorporating the latest developments. Selec has been an electrohydraulic manufacturer since 1969 and will be there if you need help in the future. 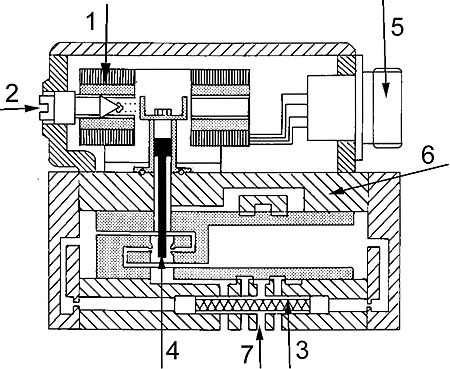 The primary stage of a two stage servo valve, shown in Figure “A”, is a current driven device. Current in the coils produce a magnetic field which deflects the flapper lever an amount proportional to the current level and in the direction consistent with the direction of current flow. The movement of the flapper lever upsets the pressure balance positioning the power spool. The power spool then repositions in the direction of the flapper lever so the pressure balance is again maintained. 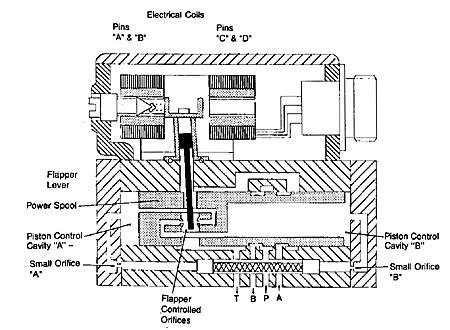 Although the power of the flapper lever is very small, the hydraulic force amplification generated on the piston control cavities “A” and “B” is enough to accurately position the power spool. If a positive current flows from pin “A” and “C” to pin “B” and “D”, the flapper lever will move to the right as shown in Figure “B”. This movement of the flapper effectively throttles the nozzle on the right while de-throttling the nozzle on the left. The result is a pressure increase in cavity “A” which is supplied with fluid from the pressure port thru the small orifice “A”. At the same time, the pressure in cavity “B” decreases as it is opened to tank “T” (drain). The pressure imbalance moves the power spool to the right until the flapper controlled nozzle gaps are equal and pressure in cavities “A” and “B” are once again equal as shown in figure “C”. The repositioning of the power spool will result in pressure port “P” being connected to control port “B” and control port “A” connected to tank or drain port “T”. By reversing the DC current direction from the above example, the flapper and main spool will move to the left and port “P” will be connected to control port “A” and control port “B” connected to tank “T” (drain). When an error exists between the command signal and the conditioned LVDT feedback signal, the amplifier produces an output current to the two-stage pilot valve. This pilot valve in turn ports fluids to and from piston cavity areas “C” and “D” to shift the third stage spool. As the third stage spool moves, the LVDT feedback signal will change accordingly to cancel the command signal. When the sum of the command voltage and the feedback volt is zero, the current output of the amplifier will also be zero. The result is the centering of the pilot valve. 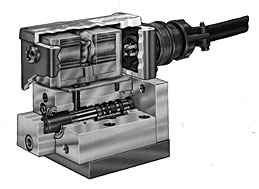 The pressure in piston control cavity “C” and “D” will be equal and the third stage spool will be at a new offset stable position.